So there I was in Guatemala, where the living is easy. Our motley crew of American, Guatemalan, and British birders abandoned the sweet pine oak habitat of Cerro Alux for the delights of a lush, deliciously vertical finca outside Antigua. Finca El Pilar cultivates coffee under a biodiverse canopy of dry, deciduous forest. Of course, dry is a relative term in Central America, as the verdant panoply of bromeliads, blossoms, and multi-tiered vegetation suggested an abundance of agua. But March is a blessedly dry month in Guatemala and many of the taller trees had dropped their leaves, making canopy watching a bit easier. Finca El Pilar was phenomenal right from the parking lot. Black-headed and Grayish Saltators were sounding off noisily from the trees, but they were no match for the cacaphonous Bushy-crested Jays, bullies in black and blue. The warbler mix was essentially the same as that of Cerro Alux, dominated by Wilson’s and Townsend’s with some Yellow, Black-throated Green, and Slate-throated Redstart thrown in to keep it interesting. I should take the time to mention the phenomenal abundance of the first two warblers – I may have seen my first Townsend’s ever just one day before, but after spotting one pristine specimen clad in luminous gold, white, and black plumage after another, I was ready for some new birds. In this, El Pilar did not disappoint. White-tipped Dove, Rose-throated Becard, Black-throated Jay, Yellow-winged Tanager, and Bar-winged Oriole all made at least limited appearances although the becards, both bright males and rufous females, turned out in numbers. 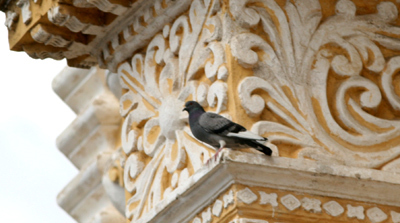 One of the feature attractions of Finca El Pilar, one that underscores the owner’s careful consideration of ecotourists, is a gallery of eight well-attended humminbird feeders surrounded by forest and flowers. 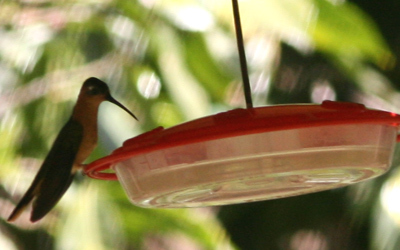 Anyone who has ever tried to identify that buzzy blur chattering through thick branches can appreciate how invaluable feeders are to actually enjoying hummingbirds. And what enjoyable hummingbirds these were! While some days, these feeders attract seven or more species of hummers, we observed only five, led by the mighty Rufous Sabrewing. This rich rust-colored bird was a behemoth compared to its compeers, beauties like Berylline, Azure-crowned, Blue-tailed, and Magnificent Hummingbirds. The show put on as these iridescent, irascible dynamos flitted about, engaging in a shifting series of skirmishes and alliances between draughts of nectar, was eminently entertaining but all too soon we had to depart. While a picturesque path curved sinuously towards altitudes sheltering whole new suites of species, we’d been on the move for about seven hours with only coffee and cookies for breakfast. Even the deranged require sustenance every so often! Tracking back to the parking lot, we found that Finca El Pilar still had more in store for us. First my life Western Tanager turned up in the canopy, a salve for the serious case of warbler neck we all suffered. Next, my first (and second) Emerald Toucanets crossed our path noisily from one thicket to another. If you’ve never seen them in life, let me assure you that toucanets of any kind are as amazing as they sound, these birds bedecked in cool kelly green and brandishing intimidating, yet brightly festive bills. 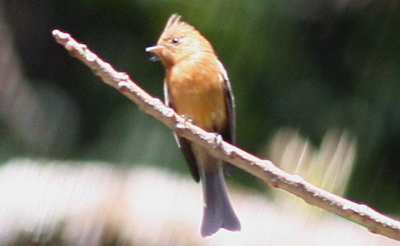 Soon a cavalcade of flycatchers turned out – Boat-billed Flycatcher, Western Kingbird, Greater Pewee, and Tufted Flycatcher, that last bird a petite rufous bird with a pert crest like that of a titmouse. Finally, we took off for Antigua. I am fully aware I have absolutely no right to say this but – I’M JEALOUS! Charlie, you’re right, you have absolutely no right to be jealous. I, on the other hand, do. So, I’M FREAKING JEALOUS!!! We have found a probable new species or race of Collared Trogon at Finca El Pilar with an orange not red breast.